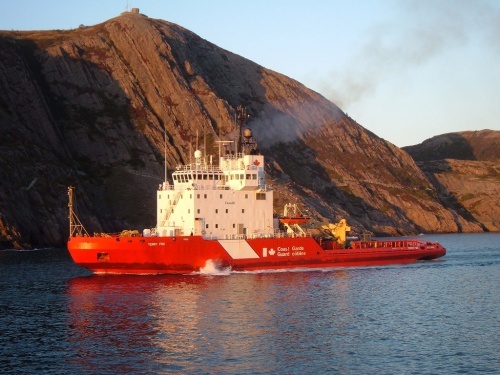 The Canadian Coast Guard has announced its plan to spend $332,000 to investigate the feasibility of incorporating fuel cell technology into its new offshore fishery science vessels. Under the current proposal, the vessels would have hybrid diesel-fuel cell propulsion systems. While at sea, the ship will be able to rely on its diesel engines and then switch to the fuel cell system to generate electricity while in port. The system is designed to both reduce emissions and fuel costs as diesel technology operates most efficiently at sea, but has a high amount of energy waste when used simply to produce electricity while docked. This feasibility study is in addition to a delayed project at the University of Victoria where the British Columbia approved $13.3 million for converting an existing ship to the technology. The Canadian Coast Guard isn’t the first to experiment with alternative fuel technologies for marine propulsion. Maritime consultancy group Germanischer Lloyd Group has also developed plans for a hydrogen powered commercial container vessel. In addition, Norwegians have been operating several dozen liquefied natural gas (LNG) fueled vessels for a decade. The vessels have reduced emissions and their fuel costs can be as much as 25% less than a traditionally powered ship. Less than two weeks ago, the Central Commission for the Navigation of the Rhine and the United Nations Economic Commission for Europe approved a LNG powered vessel for use on all international inland waterways. This move could spur additional adoption of LNG technology as the EU passes ever more stringent emissions regulations. Nuclear powered vessels have also seen limited commercial experimentation, but for now are reserved almost exclusively for icebreaking and military functions. If the current path of ever more onerous emissions regulations is continued, then shipowners will migrate in ever greater numbers to LNG and other alternative fuel sources for propulsion. Adoption of LNG technology by US shipowners might occur even faster considering natural gas prices are at near historic lows and the country is experiencing a boom in supply.